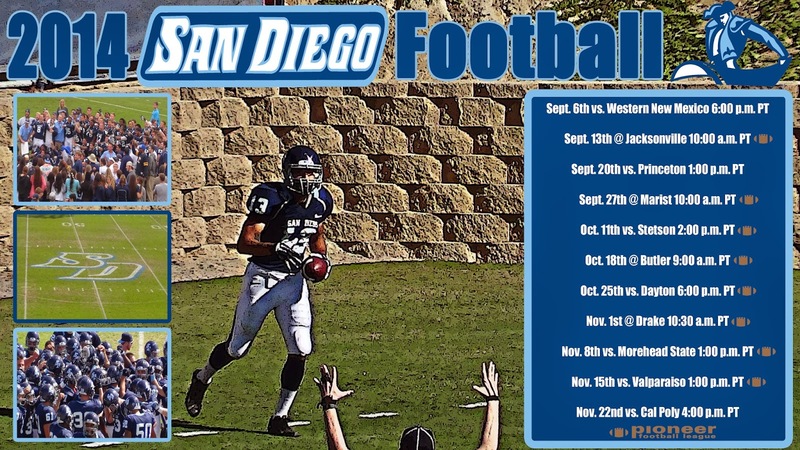 The University of San Diego Toreros will play seven home games this season while playing on the road only four times. For the fourth consecutive season, USD will kick off it's home schedule against Western New Mexico. The Toreros are 3-0 against the Mustangs after edging them 38-35 in last season's home opener. On the following week, USD will open Pioneer Football League play when they travel to Jacksonville for their first road contest of the season. It will be the first meeting between the teams since 2012 when the Toreros came away with a 24-7 victory on the road, snapping the Dolphins' 16-game home win streak. After returning home to host Princeton in a non-conference showdown, the Toreros will hit the road again to take on defending PFL co-champion Marist. The Red Foxes will be seeking redemption after a controversial game-winning field goal sent them home with a 35-33 loss last season, and would end up spoiling their playoff bid. The Toreros lead the all-time series 9-0. Following a bye week, USD returns home to host Stetson's first-ever visit to Torero Stadium, then it's back on the road to take on defending PFL co-champion Butler. When Dayton comes to town the following week, the Toreros will attempt to avenge their only PFL loss of 2013. Then they head to Iowa to take on Drake in their final PFL road trip of the season. The regular season ends with a three-week home slate featuring Morehead State, Valparaiso, and Cal Poly. The Toreros finished the 2013 season with an 8-3 record, but was forced to forfeit the PFL title and their bid to the FCS playoffs. They will be led by Dale Lindsey who returns for his second year as the head coach. The team reports to fall camp on Tuesday, August 12th.